Karlštejn Castle is one of the top day trips from Prague. We made this trip in July 2014. On the train to Karlštejn. The easiest and cheapest way to get there is by train. Karlštejn is less than an hour from from Hlavni Nadrazi (Main Station) in Prague and a return ticket is around 100 kc. 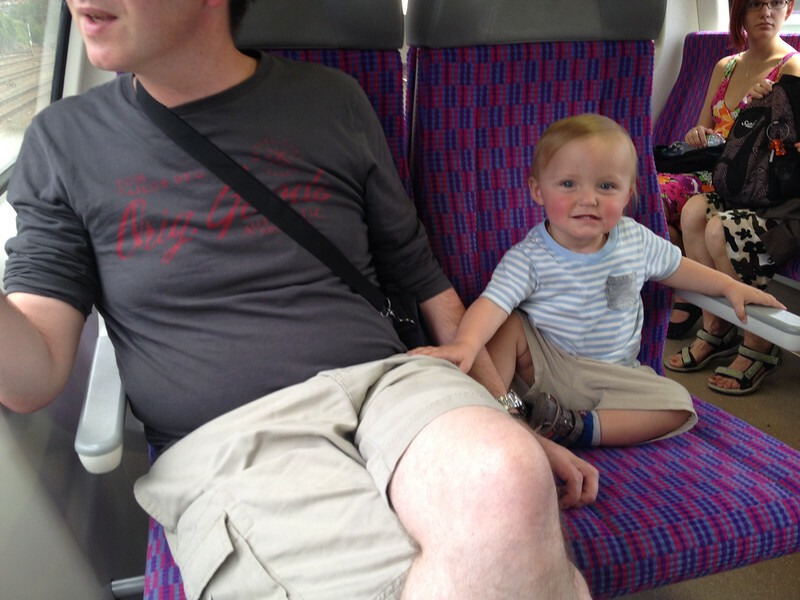 For the most scenic view, you will want to sit on the right side of the train. Along the Berounka river, you will see many small cottages, some no more than shacks. These chata (cottages) are owned by city dwellers in Prague and elsewhere and are small weekend retreats from the city where they can garden or go mushroom hunting. From the train station exit, turn right and follow the signs for “hrad” (castle). At the end of the street, you will turn left and cross over a bridge with a pretty view. At the end of the bridge, turn right and you will come to the small village of Karlštejn. It is a 30-40 minute uphill walk from the train station to the castle. 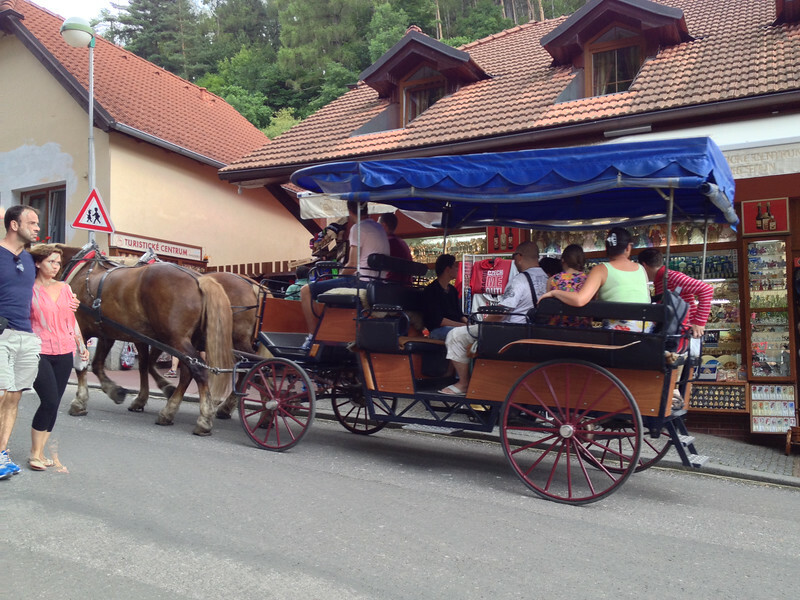 It is possible to take a taxi or horse-drawn carriage from the start of the village up to the castle and prices we saw ranged from 100-150 crowns per person for the carriage option. 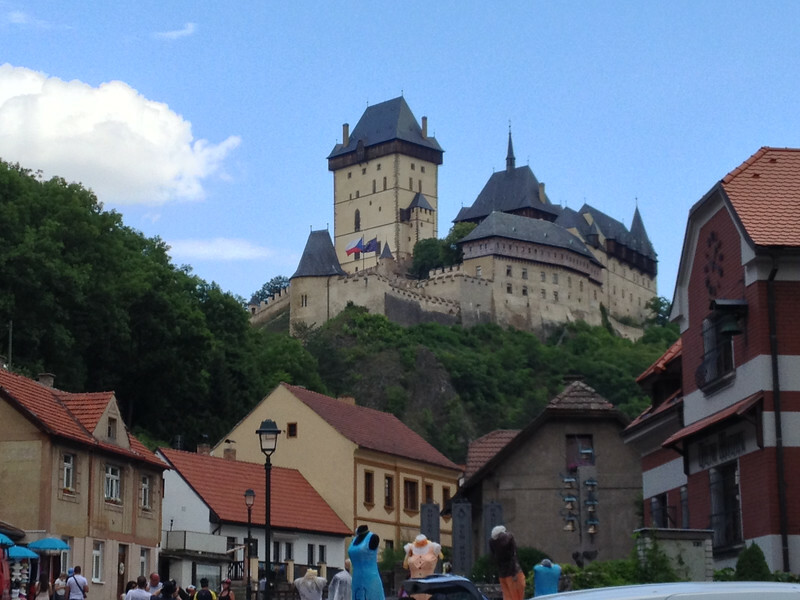 Several bicycle tour companies in Prague offer trips to Karlštejn Castle. It is a 32 km ride and you will take the train back to Prague. I have a friend in Prague who likes to ride his bike out there on a regular basis and he says that the terrain is quite even and the trip is suitable even for beginners. A carriage ride offers an easier way up the hill to the castle. Taverna U Ezopa – Greek and Czech cuisine. Located just before the bridge leading to the village. This place was recommended by friends and is the highest rated on TripAdvisor. I looked at the menu and prices were reasonable. Penzion Karlštejn – Just across the street from the station, this is a good place to stop for a beer while you are waiting for your train back to Prague. They serve typical Czech pub food. Micheal had the goulash and it was pretty standard pub fare and at a regular (not tourist) price. Beer served is Gambrinus. Restaurace a Pension U Janu Czech pub food. This one was recommended by a friend who has cycled to Karlštejn many times. It seems to draw mixed reviews online. If you stick to pub grub and stay away from things that are not typically well prepared in the Czech Republic, like steaks, you will be happier. Average prices. If you have any recommendations for higher end restaurants in Karlštejn, please leave a comment and let us know. I rarely eat meat other than fish so we don’t usually go to restaurants that specialize in steaks or wild game. 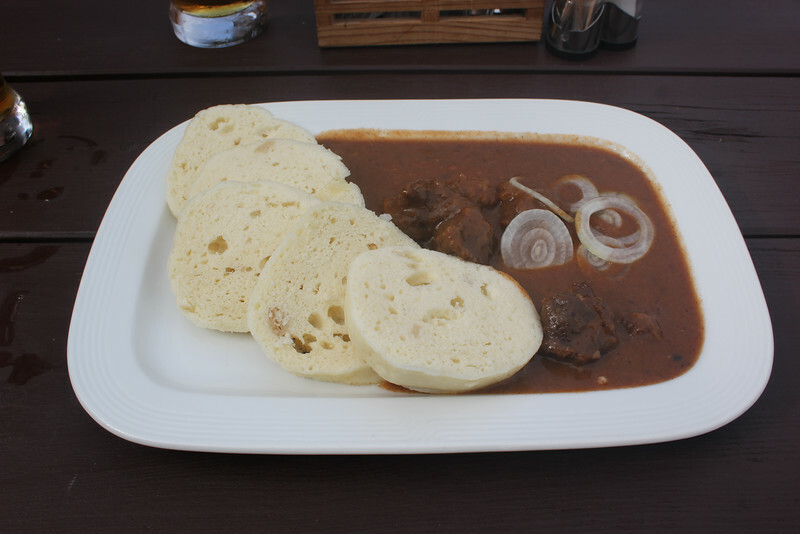 Goulash and dumplings at Penzion Karlštejn. 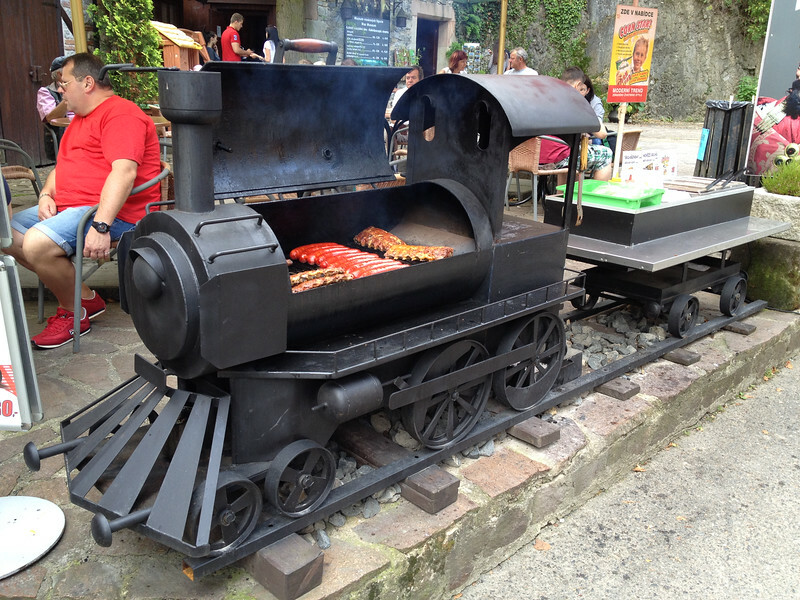 Cool grill at a restaurant close to the castle. 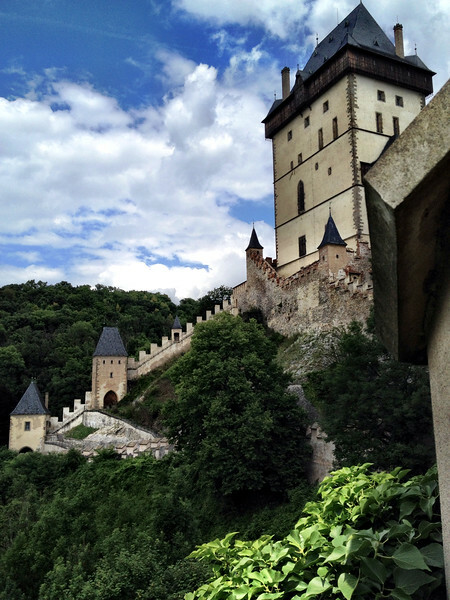 Karlštejn Castle is certainly one of the prettiest castles in the Czech Republic. Unfortunately, people are often disappointed by the spartan interior. Keep this in mind when choosing which tour you want to take. 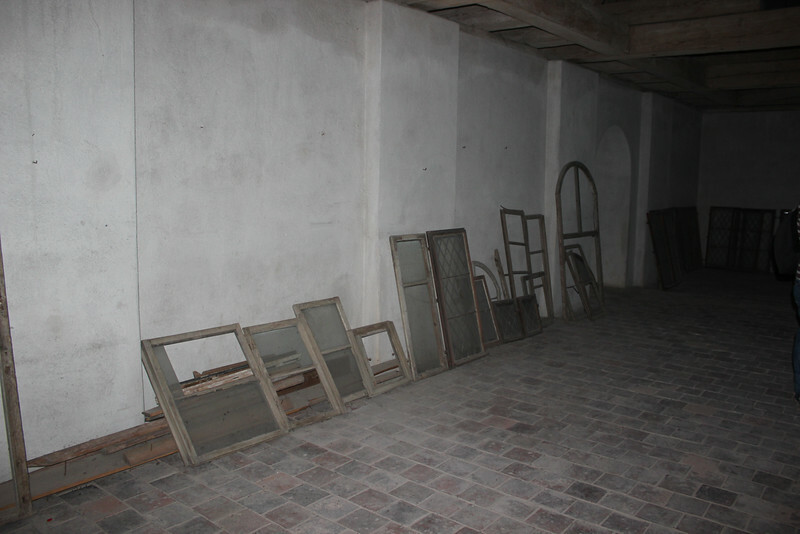 Book your tour in advance on the castle’s website or risk it being sold out, especially if you want a tour in English. If your tour is sold out, you may have to wait well over an hour for the next one. The castle is closed on Mondays. I took tour three (the others were sold out and we were tired of waiting) which included views from the Great Tower (3rd, 4th, 5th floor) but without The Chapel of The Holy Cross. It cost 150 kc. Do not take tour three! 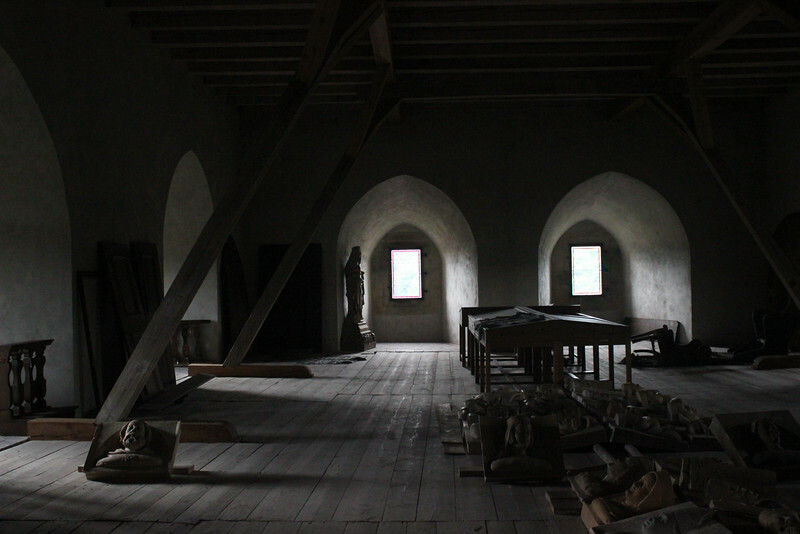 There is nothing in the Great Tower but broken window frames, pieces of broken statues and a scale model of the castle. At the time I took the tour there was also an exhibition of oriental carpets in one of the rooms but even this was disappointing. This is what you will see on Tour 3. Don’t bother. Statues waiting to be repaired. If we were to visit the castle again, I would take tour 2, which according to the website includes: “Tour 2 passes through the Marian and Great towers and offers visit to the Church of Our Lady, Chapel of St. Catharine, former Sacristy, suspension wooden bridge, museum of lapidary, castle’s picture gallery, library with exposition of the last reconstruction of the castle as well as the Holy Cross Chapel”. I will leave you with this disturbing sign that was posted on the wall of the snack kiosk in the castle courtyard. What the hell, Becherovka? We can’t be friends anymore. 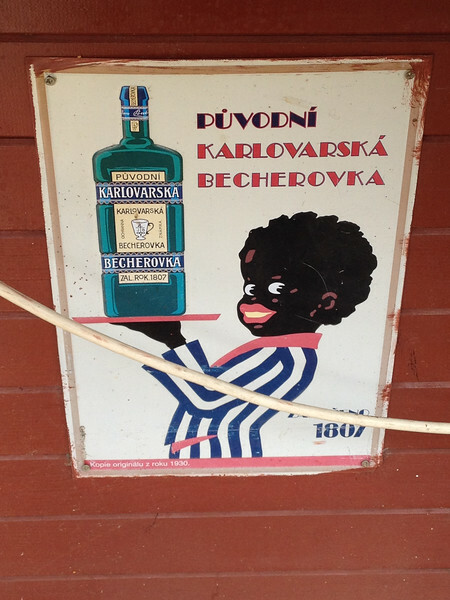 Old Becherovka sign in castle courtyard.